The above photograph shows the Stephensons of Tamworth in the early 20th Century. With the button holes, it looks like a special occasion - possibly Percival's Wedding Day in 1912. Standing are: Lizzie (1896-1980), Harry (1889-1968 - my grandfather), Annie (1891-1953), Margaret (1893-1975) and Edgar (1894-1984). Seated are: Percy (1887-1917), Elizabeth (1857-1923 - my greatgrandmother) and Charles (1888-1918). The Stephensons arrived in Tamworth in the mid 1870s. 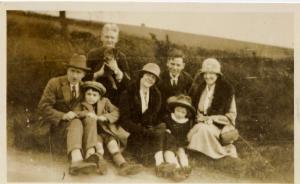 James William Stephenson (son of Isabella) was born on 1st May 1872 in New Shoreston, Northumberland. Jane Weir (daughter of Thomas and Mary) married Benjamin Willock on 16th June 1877 at the Aldergate Street Chapel in Tamworth. Why did they come to Tamworth? I would love to know. Robert Peel who had been Prime Minister twice in the 1830s and 1840s had been the town's MP from 1830 to 1850 when he died. Victoria and Albert even visited him at Drayton Manor (just outside of the town) in 1843. More importantly the railways had arrived in the country. Tamworth was an important 'junction': the high level Birmingham to Derby line had been opened by George Stephenson (no relation) on 4th August 1839; with the low level Trent Valley Line being opened on 4th December 1847. Anyway, within a short space of time the family were already living in different places in the area. Jane Stephenson (my gggrandmother), now 82, was living in Comberford Cottage, Wigginton with her youngest daughter Isabella and her husband William Harper and son James Stephenson (RG11 2769/24/4). Mary Weir, now widowed and 59, was living on a farm near Fazeley with her daughter Mary and her husband James Hall and their son Thomas W Hall (RG11 2771/10/11). Thomas James Stephenson (my greatgrandfather), now 19, was a servant working as a baker to Francis Wilson and his large family on Canal Road, Hopwas (RG11 2769/13/2). Francis is listed as a Baker and Grocer. Thomas must have learnt his trade from him, as there is also a Thomas Hemmings at the same address listed as an "Apprentice at Bakery &c."
Even though Percy died a little more than fifty years before I was born, I feel a strong bond to him. You can read about how my research ensured that he was issued with a death certificate - 88 years late - on the First World War page. His interesting middle names are taken from the husband of one his great-aunts. As Thomas James' mother was unmarried, he was brought up by Thomas and Mary Weir. They were part of the Stephenson clan that moved to Tamworth from near Bamburgh in the mid-1870s. Phyllis was pregnant when Percy died at Passchendaele in October 1917. Mary Stella Stephenson was born near Tamworth, in May 1918. What happened to her? Searching through the GRO indexes I saw a Stella Mary Stephenson born in the third quarter of 1916. I thought that there must be a family connection with a reversal of the name. It seems though, that from looking at her parents and grandparents in the census returns, there is no family connection. However, it's very interesting to note that Stella Mary was born at 7 Orchard Street in Tamworth. Isabella Harper (Percy's great-aunt and the Stephenson matriarch) lived at 3 Orchard Street at the time of the 1901 census. On 10th April 2009, I received an email from a distant relative on a different part of my dad's tree. She'd found an entry in the Staffordshire Death Indices for a Mary Stella Stephenson in 1929. This site didn't give her age, so I went to Ancestry, and found that the person was eleven years old - that would fit in with her date of birth. I sent off for the certificate, receiving it on the 22nd April. It said she was the daughter of Percival Thomas Weir Stephenson and had died from a mitreal disease of the heart. It happened in Daffodil Cottages, Hockley Road, Wilnecote - her mother's family lived there. A mystery solved. I'd spent hours looking for a possible marriage for Mary from the late 1930s to the 1950s and even thought she might have emigrated during the Second World War. 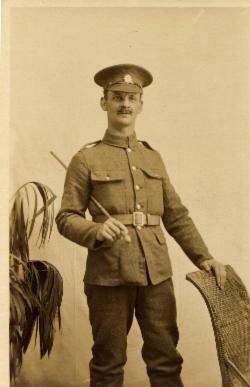 You can read some of Phyllis' feelings about Percy's death on the First World War page. 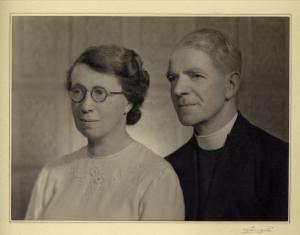 She married Wallace Gerrard in October 1922 at the Register Office in Tamworth. At the moment, I don't know exactly what happened to Phyllis after this. However, from searching through the GRO quarterly death indexes from 1922 until 1983, I found very few Phyllis Gerrards. The most likely entry is one for 1979 with the lady dying near Telford. I got the certificate in 2007 which proved this. It seems that Phyllis and Wallace had three daughters and one son between 1923 and 1932. It would be wonderful to find them or their descendents, in order to tell them about a part of Phyllis' life that they perhaps don't know about yet. At the moment, I have no idea why his first name was Craven. His family called him Charles (or Charlie), as did the Army. 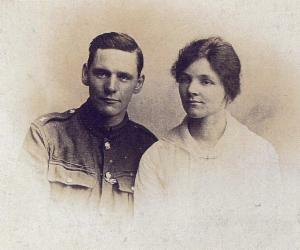 He married Constance Rose Gambles in Elford near Tamworth in April 1916. It's a really beautiful church with a long drive down from the village. When I last went there in the summer of 2006, I tried to imagine the two families and all their friends celebrating the special occasion. I thought I could just about hear the shouts of joy and congratulations still echoing from nine decades earlier. On the marriage certificate, it says that Charles was a confectioner, whilst her father ran the mill at Elford. Auntie Connie was the Postmistress in Edingale for many years. It seems that she was a very colourful character, travelling to Tamworth on her bike once a week. She never remarried after Charles was killed. They had been engaged for about six years and spent most of their two years of marriage apart due to the War. She died in 1966.
photo of my grandfather which says "Aug 2nd 1913, To Beatty from Harry" on the reverse. In the photo on the right, Harry is holding the dog (Toby), on his left is Lizzie and Harvey with their daughter in front of them. Beatrice is on the far right. On the left are "two folks from Newcastle." I wonder if they're part of the Stephenson family? What must have started out as a very exciting month, October 1926 ended tragically. Four days after giving birth to a son, Beatrice died of heart failure. On 18th October, Harry registered both his son's birth and his wife's death. I remember how excited I was when I registered my son's birth with the Registrar. I can not imagine how Harry must have felt on that day. For much of his adult life, Harry worked for the local firm Gibbs and Canning Ltd (as did both of his father-in-laws: Oliver James Deeming and George Brain - and his father George senior). For more information on this firm look here. I really like this photo, which was probably taken in 1930. 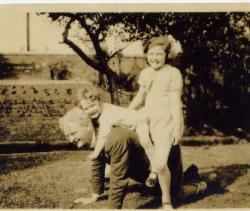 Even though my grandfather had recently experienced a lot of sorrow with the deaths of his older brothers Percival (1917) and Charles (1918), his mother (1923) and his first wife (1926), he could still have fun. Here he is with his first son (my dad's half brother) and neice. 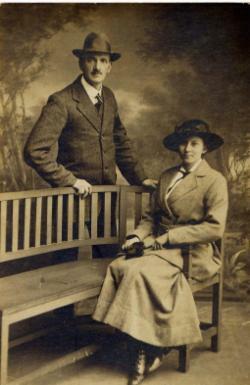 Annie married Howard Lyons Smith at the Register Office, Tamworth in March 1916. Her family called her Cissie. Howard died in 1934. They had one son, Philip. He was a herdsman and farm manager. Sadly he died in 2004, aged only 72. Maggie married Archibald V W Williams, another baker, in May 1915 in Selby Hill, Worcestershire. He died of bronchopneumonia just over 34 years later in June 1949. It is interesting that her birth certificate calls her "Maggie", whereas her marriage and death certificates name her as "Margaret Elizabeth". Of course, her grandmother was Elizabeth Margaret Stephenson. I have a book with "Maggie Stephenson" written on the inside front cover. It is called The Comparative Atlas Physical & Political (5th edition) from Professor Meiklejohn's Geographical Series. It was probably published 1908-10. Maggie and Archibald had three children. Their youngest was the senior driving examiner in Burton. Horrifically in 1972 a lorry collided with his car, which then burst into the flames and he was killed. The Burton Daily Mail carried a full report on it's front page the following day. 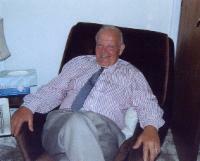 Uncle Edgar is the only member of the Stephenson family to get an entry in Who's Who and of course Crockford's. You can read more about his life here. It has been very interesting tracing his career, becoming Archdeacon of Rochdale in 1951. With thanks to the Manchester Archives, I have copies all of his ordination papers, including references, his degree certificates and various correspondence from the 1920s. 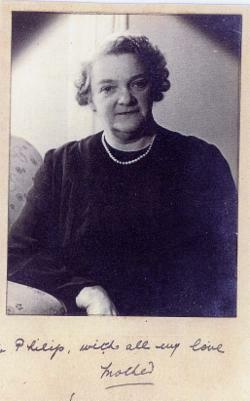 He married Kathleen Taws in Macclesfield in August 1926. Harry was one of the witnesses. On their marriage certificate, I noticed that Kathleen is described as "graduate, licence mistress". Putting two and two together and hopefully getting four, I contacted Manchester University to see if she had studied there. In September 2007, they sent me a list which included both Edgar and Kathleen as Graduates of the University. 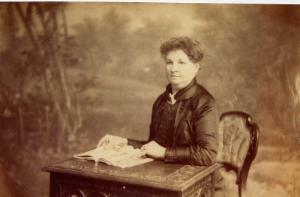 Kathleen gained a BSc in Botany in 1923 and a teaching diploma in 1924. It seems very likely then that they met at University. There is a picture of Edgar in army uniform on the 1st World War page. Kathleen died in 1993. Lizzie married Harvey Dakin at the Register Office, Tamworth, in December 1918. They had one daughter, who continues to give me very interesting anecdotes about the family whenever I visit her. She has also let me borrow a few of the photos that appear on this site so that I could scan them at home. Harvey died in 1967.